Grant Timing. The exercise price is not negotiable, but you will want to follow up after your start date to be sure that the board grants the options promptly. Delays are common and can increase the exercise price dramatically and reduce the value of your stock options. Protection for Unvested Shares. The standard vesting schedule will not protect unvested shares in an acquisition. Consider negotiating for double trigger acceleration upon change of control. Tax Structure. The right tax structure will balance your interests in total value, low tax rates, tax deferral, limited tax risks and investment deferral. You can see the full post on the Stock Option Counsel Blog, along with other great information on startup equity negotiations. Happy reading. If you have an Offer Letter from a startup, you may notice that it’s light on information about stock options. You may see a few sentences noting that (1) the company will recommend to the board that the grant be made at the first market value on the date of grant; (2) the option will vest monthly over four years with a one-year cliff; and (3) the option will be governed by the company’s equity incentive plan and your stock option agreement. It sounds simple. But the key issues are hidden between the lines. A standard vesting schedule does not provide protection for unvested shares in the event the company is acquired. If you are joining in a senior position or as an early stage employee, consider negotiating for a double trigger acceleration upon change of control to protect the right to earn unvested shares. The most robust double trigger language would provide that 100% of unvested shares will accelerate if you are terminated or constructively terminated as part of or at any time following a change of control. See this blog post for more information on change of control terms for startup equity offers. The equity incentive plan and stock option agreement are usually not provided with the Offer Letter unless requested, as the official equity grant is not made until after the start date. However, these agreements contain important details about the grant, so it makes sense to review them before agreeing to the number of shares or signing the Offer Letter. For example, the equity incentive plan and stock option agreement may give the company the right to forcibly repurchase shares from the employee after termination of employment, even if they are vested shares of restricted stock or vested shares issued upon exercise of options. See this post for some examples of how those clawbacks may be drafted. Clawbacks dramatically limit the value of the equity, as the most significant increase in the value of startups has historically been at the time of an exit event. If this term, or any other red flag term, appears in the form documents, it makes sense to negotiate these out of the deal or provide for alternative compensation to make up for the potential loss in value before signing the Offer Letter. The Offer Letter may not include the terms of the tax structure, but if you have any leverage on those terms the Offer Letter negotiation is the time to address them. The right tax structure will balance your interests in total value, low tax rates, tax deferral, limited tax risks and investment deferral. This balance is different at each company stage. For example, at the earliest stage startups you may be able to meet all those goals with the purchase of Restricted Stock for a de minimis purchase price. At mid-stage startups you might prefer to have Incentive Stock Options with an extended post-termination exercise period to defer the investment until a liquidity event. At late-stage startups you might prefer Restricted Stock Units for a full value grant. See this blog post on Examples of Good Startup Equity Design by Company Stage. The company will set the exercise price at the fair market value ("FMV") on the date the board grants the options to you. This price is not negotiable, but to protect your interests you want to follow up after your start date to be sure that the board makes the grant of the options soon after your start date. If they delay granting you the options until after a financing or other important event, the FMV and the exercise price will go up. This would reduce the value of your stock options by the increase in value of the company’s common stock during that time. Negotiating your startup stock option offer? Use this video to understand the exercise price. Here's our Q1 2018 Newsletter. Sign up for our mailing list to receive these quarterly updates! The final Tax Cuts and Jobs Act of 2017 is already affecting startup equity holders. Check out my recent blog posts on Tax-Deferred Option Exercises Under the New Section 83(i) and Incentive Stock Options & Changes to the Alternative Minimum Tax. Here's the short version. Tax Deferral for Option Exercise - New Section 83(i) Election. The new Section 83(i) was designed to defer taxation from a stock option exercise until the shares become liquid. Unfortunately, the details of the new Section 83(i) make it unlikely to work for most startup option holders. But where it does apply it will defer taxation for up to five years from the date of option exercise with the use of the new Section 83(i) Election. These are the key details of the new Section 83(i). Tax Relief for ISO Exercise - New AMT Limits. Dramatic increases to the exemption amounts and phase out thresholds of the Alternative Minimum Tax (AMT) will allow many more startup employees to exercise Incentive Stock Options (ISOs) tax-free. This allows for more planning opportunities to take advantage of the potential ISO tax benefits of capital gains tax rates on all gains. These are the key details of the AMT changes as they relate to ISO exercise. The final Tax Cuts and Jobs Act of 2017 added a new Section 83(i) to the Code intending to allow holders of RSUs and options to defer tax on those benefits until they are able to sell the shares to cover their tax bills. Its drafting makes it unlikely to apply in practice at most startups, but where it applies it can defer taxation for up to five years from the date of option exercise or RSU vesting. Many issues related to the Section 83(i) Election are unclear from the legislation and will need to be clarified by IRS guidance. So this is the best of my understanding as of today. This is not tax advice for readers, so please consult with your own accountant or CPA. Because well-designed startup RSUs are already structured to defer taxation until liquidity, the benefits of tax deferral under Section 83(i) are most needed for option exercises. For eligible option exercises, a timely election under Section 83(i) will defer income at exercise until the earlier of the (i) IPO; (ii) the first date the stock becomes transferable (including to the employer), (iii) five years from exercise, (iv) the first date the employee becomes an “excluded employee,” or (v) the date the election is revoked. The 83(i) Election must be made within a 30-day period after exercise. 1. The company must have offered stock options on terms that provide the same rights and privileges (other than the number of shares) in the calendar year of grant to at least 80% of its U.S. employees. Since most startups do not make annual grants of stock options, this would be unlikely to apply except in years of very high growth in staff size, or to the occasional startup that gives broad-based annual refresh grants. 2. The individual must not be a significant owner or executive of the company. The ownership test is met by 1% ownership. The executive test relates to role, such as CEO and CFO, as well as total compensation, as it applies to the four most highly compensated officers of the company. Both definitions have historical applicability, such as a 10-year look back, as well as future applicability, so that if one of the definitions is met after the Section 83(i) Election, the individual becomes an “excluded employee” and the tax deferral ends. I understand that the new tax bill created a Section 83(i) Election to allow deferral of taxation at option exercise until the earlier of 5 years from exercise or liquidity. But there are certain rules that have to be met for an option to be eligible, including related to the company’s option grant practices, my own ownership percentage and other requirements. Can you please confirm whether, if I exercise this option, I will be eligible to make a Section 83(i) Election on the stock I purchase? Individuals who are eligible to make the Section 83(i) Election will want to consider the pros and cons based on the tax consequences and their investment plans. For example, exercising options and filing the Section 83(i) Election will not solve the pre-liquidity taxation problem if there is not a liquidity event before the five-year (or earlier) deadline. And the Section 83(i) Election converts ISOs into NQSO, so any favorable tax treatment associated with ISOs would be lost. Since the alternative minimum tax exemptions have increased so dramatically, ISOs are more likely to be AMT-free at exercise. Such an ISO exercise may ultimately result in more favorable tax treatment than the Section 83(i) Election, if the shares are held for the full ISO holding periods. And, as in any option exercise, paying the exercise price itself is an investment risk and having a tax-deferred exercise does not make the exercise risk-free. 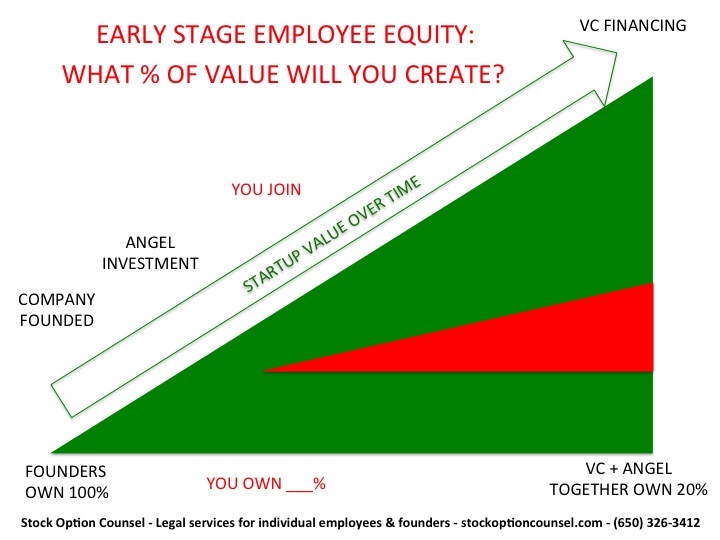 All well-negotiated startup equity offers include planning for investment timing, tax timing and tax rates. While the Section 83(i) Election is a new tool in that toolbox, it is not likely to be the most advantageous planning method for new grants. See this post for some examples of my favorite structures for equity offer negotiations. The final Tax Cuts and Jobs Act of 2017 will reduce Alternative Minimum Tax ("AMT") bills for many who exercise Incentive Stock Options ("ISOs") in two ways - one direct and one indirect. The increased AMT exemption decreases the likelihood of triggering AMT at exercise of ISOs. For those ISO exercises that do trigger AMT, the increased AMT phase-out threshold may reduce the amount of AMT due. The result of these changes is a maximum savings of $18,000 for an individual exercising ISOs. Second, the bill reduced or repealed several triggers of the prior AMT, such as state and local tax deductions. This reduces the number of taxpayers who will need to use their AMT exemption amount for non-ISO AMT items. According to Joe Rosenberg of the Tax Policy Center, as quoted in the Wall Street Journal, only about 200,000 returns will be subject to AMT in 2018 down from approximately five million in 2017. So starting in 2018 most taxpayers will not have “used up” the AMT exemption amount on non-ISO related items and therefore will be able to use the entire AMT exemption amount to offset gains at exercise of options. In addition, these new thresholds may trigger the release of AMT credit carryovers. What does this mean for existing ISO grants? Precisely planning your ISO exercises can allow you to take advantage of the ISO benefits, which will be more favorable under the revised AMT limits. Work with your accountant or financial advisor to determine precisely how many ISOs can be exercised per year to fall within the AMT exemption amount for your phase-out threshold status. 3. Wait to exercise all ISOs until the shares will be sold to pay the taxes due at liquidity and the exercise price. This is likely to have the highest tax rates but the lowest investment risk. However, if the ISOs expire early at employment termination, leaving your job may make this impossible. More on this issue here. WHAT DOES THIS MEAN FOR NEGOTIATING A NEW STOCK OPTION OFFER? ISOs are more favorable than NSOs (unless you are early exercising while the exercise price is equal to the FMV). The revised AMT limits make their benefits even more appealing. So, if you are negotiating a stock option offer, make sure the grant will qualify as ISOs up to the limits under the law. I would be happy to hear from you if you are navigating an existing option grant or negotiating a new offer. For more information, please see this FAQ or contact me at (650) 326-3412 or by email. It’s helpful for startup employees to understand early expiration of stock options and the possible solution of a full 10 year term to exercise. But the full 10 year term stock option is not the right design for every startup equity grant! In some cases it would be the wrong ask, and pushing for it can can lead to embarrassment or a disadvantageous design. In advising on the right structure for clients of Stock Option Counsel - Legal Services for Individuals, I work with individuals to balance their priorities for investment timing, tax timing, tax rates and value structure. These are some examples of how the trade-offs are made at each stage. While a startup is in its early stages and its Fair Market Value (FMV) is quite low, consider purchase of Restricted Stock for founders and early employees. This is the model used for Founders’ Stock at startups, and it is also ideal for executives and employees who are willing to pay the FMV of the common stock up-front for their shares. With the use of an 83(b) election with the IRS, Restricted Stock purchase provides for tax deferral until sale of stock, favorable capital gains tax rates at sale of stock, and fewer tax penalties than stock options in the event the IRS determines the FMV was underpriced for the shares. For those who are willing to take early investment risks for tax deferral and lower tax rates, consider early exercise of stock options. This is an obvious choice for early-stage startup hires who can afford the stock purchase price at hire. For example, at a very early stage startup an employee’s total exercise price might be less than $1,000. Early exercise may also be a good choice for some individuals at mid-stage startups with somewhat higher exercise prices or even later stage startups with high growth potential, as an early investment may be worth it for future tax savings and/or tax deferral. Early exercise stock options can be exercised before vesting. If they are exercised before the FMV rises above the exercise price, tax payments are deferred until sale of stock by use of a Section 83(b) election at the time of purchase. However, the investment risk is real, as the purchase price is delivered up-front and shares are held as an investment. If the shares were to become worthless, the investment amount would be lost for both vested and unvested shares. Early exercise stock options are preferable to restricted stock if the employee is not sure about making the investment up-front. Unlike the purchase of restricted stock, the choice to exercise stock options (even with early exercise rights) can be deferred for some time. However, if the exercise or early exercise is made after the FMV has gone up, the exercise will lead to taxable income. The early exercise structure can be combined with an extended exercise period (see below under #3 or more here on the blog), so that the employee has the choice between early exercising to minimize tax rates or deferring exercise until any time within the full 10 year term. Note that the right to early exercise can be a disadvantage for stock option grants with an exercise price greater than $100,000 if they are not early exercised. Any amounts over $100,000 would be ineligible for ISO status due to the ISO rules’ $100,000 limitation. While there is still potential for high growth in value, stock options are an advantage for employees. However, a high exercise price or a high tax bill at exercise can make it impossible for employees to take advantage of the value of stock options. This is because stock options have traditionally been granted with a disadvantageous early expiration term requiring exercise within three months of an optionee’s termination date. Therefore, stock options are most advantageous where they are granted with a full 10 year term to exercise regardless of the date of termination. This allows the optionee to defer the investment decision and the associated tax bill for exercise. Additional consideration: Optionees who take advantage of an extended exercise period (exercise their options after 90 days from last employment) lose their Incentive Stock Option (ISO) tax treatment. Shares exercised after 90 days from last employment will be treated as Non-Qualified Stock Options (NQSOs) and generally come with a higher tax rate. However, with this extended exercise design, optionees can choose to exercise within 90 days and keep their ISO classification, or wait to exercise and accept the NQSO classification. This flexibility is key in rewarding optionees of all types and financial circumstance. Employees may prefer RSUs to stock options at later stage companies for both tax deferral and offer value purposes. Well-designed RSUs defer taxes until liquidity so long as it is within a certain time frame (such as 7 years from the date of grant). RSUs are less advantageous for tax rates, though, as the value of the shares is taxed as ordinary income at settlement. RSUs are advantageous from an investment perspective because there is no investment risk as there would be in a stock option exercise prior to liquidity. RSUs also give the employee the full value of the shares at liquidity as there is no purchase price to pay for the stock as there would be with a stock option exercise price. For this reason, a grant of RSUs generally consists of fewer shares than a grant of stock options at a company of the same stage. This is Part 3 of a 3-part series on the startup scene’s debate about early expiration stock options. See Early Expiration of Startup Stock Options - Part 1 - The $1 Million Problem for more information on the issue and Early Expiration of Startup Stock Options - Part 2 - The Full 10-Year Term Solution for more information on the full 10-year term solution. This post focuses on structures used for employee equity for clients of Stock Option Counsel - Legal Services for Individuals. For more counsel on these design matters or on executive and key hire equity design, please contact me. This post focuses on VC-backed Silicon Valley startup equity design structures. Not all startup equity is created equal. For more on the key differences, see The Gold Standard of Startup Equity - A Guide for Employees. Thank you to attorney Augie Rakow, a partner at Orrick who advises startups and investors, for sharing his creative solution to this problem in Early Expiration of Startup Stock Options - Part 2 - The Full 10-Year Term Solution. Thank you to JD McCullough for edits to this post. JD is a health tech entrepreneur, interested in connecting and improving businesses, products, and people. Attorney Mary Russell counsels individuals on startup equity, including founders on their personal interests and executives and key contributors on offer negotiation, compensation design and acquisition terms. Please see this FAQ about her services or contact her at (650) 326-3412 or at info@stockoptioncounsel.com. Originally published February 12, 2014. Updated April 6, 2017. "Hey baby, what's your employee number?" A low employee number at a famous startup is a sign of great riches. But you can't start today and be Employee #1 at Square, Pinterest, or one of the other most valuable startups on Earth. Instead you'll have to join an early-stage startup and negotiate a great equity package. This post walks through the negotiation issues in joining a pre-Series A / seed-funded / very-early-stage startup. Q: Isn't it a sure thing? They have funding! No. Raising small amounts from seed stage investors or friends and family is not the same sign of success and value as a multi-million dollar Series A funding by venture capitalists. According to Josh Lerner, Harvard Business School’s VC expert, 90 percent of new businesses don’t make it from the seed stage to a true VC funding and end up shutting down because of it. So an equity investment in a seed-stage startup is an even riskier game than the very risky game of an equity investment in a VC-funded startup. Here's an illustration from Dustin Moskovitz's presentation, Why to Start a Startup from Y Combinator's Startup School on the chances so "making it" for a startup that has already raised seed funding. What are the chances of a seed-funded startup becoming a "unicorn" (here, defined as having 6 rounds of funding rather than the traditional definition of a $1 billion valuation). Q: How many shares should I get? Don't think in terms of number of shares or the valuation of shares when you join an early-stage startup. Think of yourself as a late-stage founder and negotiate for a specific percentage ownership in the company. You should base this percentage on your anticipated contribution to the company's growth in value. Q: How should early-stage startups calculate my percentage ownership? You'll be negotiating your equity as a percentage of the company's "Fully Diluted Capital." 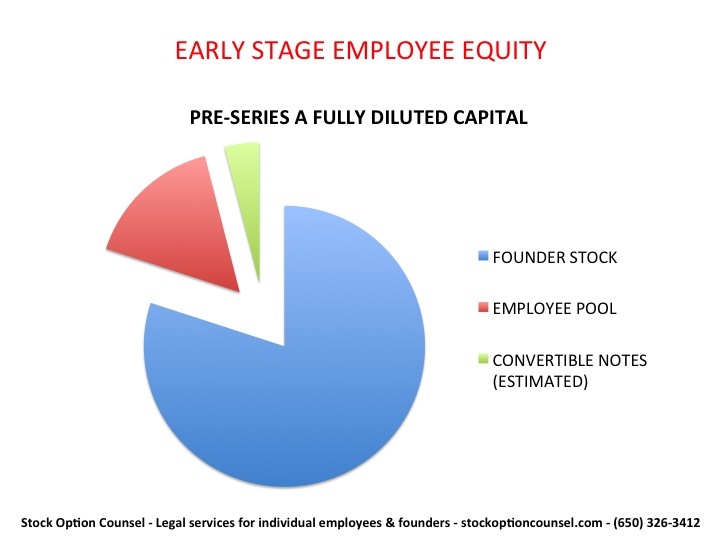 Fully Diluted Capital = the number of shares issued to founders ("Founder Stock") + the number of shares reserved for employees ("Employee Pool") + the number of shares issued or promised to other investors ("Convertible Notes"). There may also be warrants outstanding, which should also be included. Your Number of Shares / Fully Diluted Capital = Your Percentage Ownership. Be aware that many early-stage startups will likely ignore Convertible Notes when they give you the Fully Diluted Capital number to calculate your ownership percentage. Convertible Notes are issued to angel or seed investors before a full VC financing. The seed stage investors give the company money a year or so before the VC financing is expected, and the company "converts" the Convertible Notes into preferred stock during the VC financing at a discount from the price per share paid by VCs. Since the Convertible Notes are a promise to issue stock, you'll want to ask the company to include some estimate for conversion of Convertible Notes in the Fully Diluted Capital to help you more accurately estimate your Percentage Ownership. Q: Is 1% the standard equity offer? 1% may make sense for an employee joining after a Series A financing, but do not make the mistake of thinking that an early-stage employee is the same as a post-Series A employee. First, your ownership percentage will be significantly diluted at the Series A financing. When the Series A VC buys approximately 20% of the company, you will own approximately 20% less of the company. Second, there is a huge risk that the company will never raise a VC financing. According to CB Insights, about 39.4% of companies with legitimate seed funding go on to raise follow-on financing. And the number is far lower for seed deals in which legitimate VCs are not participating. Don't be fooled by promises that the company is "raising money" or "about to close a financing." Founders are notoriously delusional about these matters. If they haven't closed the deal and put millions of dollars in the bank, the risk is high that the company will run out of money and no longer be able to pay you a salary. Since your risk is higher than a post-Series A employee, your equity percentage should be higher as well. Q: Is there anything tricky I should look out for in my stock documents? Does the company maintain any repurchase rights over my vested shares or any other rights that prevent me from owning what I have vested? If the company answers "yes" to this question, you may forfeit your equity when you leave the company or are fired. In other words, you have infinite vesting as you don't really own the shares even after they vest. This can be called "vested share repurchase rights," "clawbacks," "non-competition restrictions on equity," or even "evil" or "vampire capitalism." Most employees who will be subject to this don't know about it until they are leaving the company (either willingly or after being fired) or waiting to get paid out in a merger that is never going to pay them out. That means they have been working to earn equity that does not have the value they think it does while they could have been working somewhere else for real equity. According to equity expert Bruce Brumberg, "You must read your whole grant agreement and understand all of its terms, even if you have little ability to negotiate changes. In addition, do not ignore new grant agreements on the assumption that these are always going to be the same." When you are exchanging some form of cash compensation or making some other investment such as time for the equity, it makes sense to have an attorney review the documents before committing to the investment. Q: What is fair for vesting? For acceleration upon change of control? The standard vesting is monthly vesting over four years with a one year cliff. This means that you earn 1/4 of the shares after one year and 1/48 of the shares every month thereafter. But vesting should make sense. If your role at the company is not expected to extend for four years, negotiate for an vesting schedule that matches that expectation. When you negotiate for an equity package in anticipation of a valuable exit, you would hope that you would have the opportunity to earn the full value of the package. However, if you are terminated before the end of your vesting schedule, even after a valuable acquisition, you may not earn the full value of your shares. For example, if your entire grant is worth $1 million dollars at the time of an acquisition, and you have only vested half of your shares, you would only be entitled to half of that value. The remainder would be treated however the company agrees it will be treated in the acquisition negotiation. You may continue to earn that value over the next half of your vesting schedule, but not if you are terminated after the acquisition. Some employees negotiate for “double trigger acceleration upon change of control.” This protects the right to earn the full block of shares, as the shares would immediately become vested if both of the following are met: (1st trigger) after an acquisition which occurs before the award is fully vested (2nd trigger) the employee is terminated (as defined in the stock option agreement). Q: The company says they will decide the exercise price of my stock options. Can I negotiate that? The company will set the exercise price at the fair market value ("FMV") on the date the board grants the options to you. This price is not negotiable, but to protect your interests you want to be sure that they grant you the options ASAP. Let the company know that this is important to you and follow up on it after you start. If they delay granting you the options until after a financing or other important event, the FMV and the exercise price will go up. This would reduce the value of your stock options by the increase in value of the company. Early-stage startups very commonly delay making grants. They shrug this off as due to "bandwidth" or other nonsense. But it is really just carelessness about giving their employees what they have been promised. The timing and, therefore, price of grants does not matter much if the company is a failure. But if the company has great success within its first years, it is a huge problem for individual employees. I have seen individuals stuck with exercise prices in the hundreds of thousands of dollars when they were promised exercise prices in the hundreds of dollars. Q: What salary can I negotiate as an early-stage employee? When you join an early-stage startup, you may have to accept a below market salary. But a startup is not a non-profit. You should be up to market salary as soon as the company raises real money. And you should be rewarded for any loss of salary (and the risk that you will be earning $0 salary in a few months if the company does not raise money) in a significant equity award when you join the company. 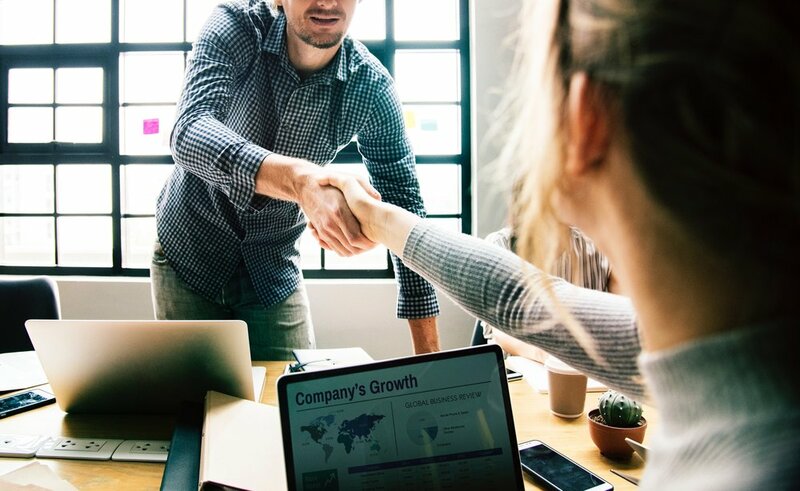 When you join the company, you may want to come to agreement on your market rate and agree that you will receive a raise to that amount at the time of the financing. You can also ask when you join for the company to grant you a bonus at the time of the financing to make up for your work at below-market rates in the early stages. This is a gamble, of course, because only a small percent of seed-stage startups would ever make it to Series A and be able to pay that bonus. Q: What form of equity should I receive? What are the tax consequences of the form? 1. [Tie] Restricted Stock. You buy the shares for their fair market value at the date of grant and file an 83(b) election with the IRS within 30 days. Since you own the shares, your capital gains holding period begins immediately. You avoid being taxed when you receive the stock and avoid ordinary income tax rates at sale of stock. But you take the risk that the stock will become worthless or will be worth less than the price you paid to buy it. 1. [Tie] Non-Qualified Stock Options (Immediately Early Exercised). You early exercise the stock options immediately and file an 83(b) election with the IRS within 30 days. There is no spread between the fair market value of the stock and the exercise price of the options, so you avoid any taxes (even AMT) at exercise. You immediately own the shares (subject to vesting), so you avoid ordinary income tax rates at sale of stock and your capital gains holding period begins immediately. But you take the investment risk that the stock will become worthless or will be worth less than the price you paid to exercise it. 3. Incentive Stock Options ("ISOs"): You will not be taxed when the options are granted, and you will not have ordinary income when you exercise your options. However, you may have to pay Alternative Minimum Tax ("AMT") when you exercise your options on the spread between the fair market value ("FMV") on the date of exercise and the exercise price. You will also get capital gains treatment when you sell the stock so long as you sell your stock at least (1) one year after exercise AND (2) two years after the ISOs are granted. 4. Restricted Stock Units ("RSUs"). You are not taxed at grant. You do not have to pay an exercise price. But you pay ordinary income tax and FICA taxes on the value of the shares on the vesting date or at a later date (depending on the company's plan and when the RSUs are "settled"). You probably will not have a choice between RSUs and stock options (ISOs or NQSO) unless you are a very early employee or serious executive and you have the power to drive the company's capital structure. So if you are joining at an early stage and are willing to lay out some cash to buy common stock, ask for Restricted Stock instead. 5. Non-Qualified Stock Option (Not Early Exercised): You owe ordinary income tax and FICA taxes on the date of exercise on the spread between the exercise price and the FMV on the date of exercise. When you sell the stock, you have capital gain or loss on the spread between the FMV on the date of exercise and the sale price. Q: Who will guide me if I have more questions? This is Part 1 of a 3-part series. See Early Expiration of Startup Stock Options - Part 2 - The Full 10-Year Term Solution and Early Expiration of Startup Stock Options - Part 3 - Examples of Good Startup Equity Design by Company Stage. If a stock option is not exercised by this deadline, it expires and the individual forfeits all rights to the equity they earned. In some cases, this period is shorter, such as expiration 1 month after or even the day of last employment. 3. Walk away and lose the vested value. This can be a $1 million problem for employees at successful companies because the tax bill due at exercise is based on the value of the shares at exercise. Either ordinary income or alternative minimum taxable (AMT) income may be recognized at exercise. This income will equal the difference between the option exercise price and the value of the shares at the time of exercise. The value of the shares is usually called fair market value (FMV) or 409A valuation. These values are generally set by an outside firm hired by the company. The company may try to set these valuations as low as possible to minimize this problem for employees, but IRS rules generally require that the FMV increases with investor valuations and business successes. REMEMBER: FMV at exercise is not cash in hand without a liquidity event. Therefore, if the option holder in this example makes the investment of $50,000 plus the tax payment of $1,027,000, they might never realize the $4 million in stock option value they earned, or even reclaim the $1,077,000 exercise price + tax. The shares may never become liquid and could be a total loss. For someone who goes into debt to exercise and pay taxes, that might mean bankruptcy. So, even if they can come up with $1 million to solve the early expiration problem at exercise, they may have wished they had not if the company value later declines. Investor-types frame this as a simple investment choice - the option holder needs to decide whether or not to bet on the company by the deadline. But many people simply do not have access to funds to cover these amounts. It’s not a realistic choice. The very success of the company they helped create makes it impossible to exercise the stock options they earned. Although these numbers may seem impossibly large, I regularly see this problem at the $1 million + magnitude for individual option holders. The common demographic for the problem is very early hires of startups that grew to billion-dollar valuations. Early expiration of stock options is a hot issue right now because successful startups are staying private longer and staying private after unprecedented valuations. These successful but still private companies have also been enforcing extreme transfer restrictions. These longer timelines from founding to IPO, higher valuations between founding and IPO, and transfer restrictions are causing the early expiration of stock options to affect more employees. 1. Later IPOs = more likely early expiration applies before liquidity. The typical tenure of a startup employee is 3-4 years. As companies stay private longer, employees are more likely to leave a company after their shares have vested but before an IPO. If they have to exercise within the early expiration period but before an IPO, they must pay taxes before they have liquidity to pay the taxes. 2. Higher valuations = higher grant prices. Exercise prices for stock option grants must be set at the fair market value (“FMV” or “409A Value”) of common stock on the date of grant. If an individual joins a company that has had some success in raising funds and in business, the FMV at grant will be higher. Therefore, departing employees are more likely to have hefty exercise prices to pay within an early expiration period. With delayed IPOs they are unlikely to have access to liquidity opportunities to cover exercise prices. 3. Higher valuations = higher tax due at exercise. Total tax bills at exercise are more likely to be high as the company valuations are high because taxable income (either ordinary income or alternative minimum taxable income) is generally equal to FMV at Exercise - Exercise Price. With delayed IPOs, employees are unlikely to have access to liquidity opportunities to cover tax bills. 4. Extreme transfer restrictions = no liquidity prior to IPO or acquisition. In the past, private company stock could be transferred to any accredited investor so long as the seller first offered to sell the shares to the company. (This is known as a right of first refusal or ROFR. The market for pre-IPO stock is known as the secondary market.) Some companies are prohibiting such secondary market transfers and similar structures such as forward sales or loans that had historically allowed employees of hot companies to get liquidity for the shares to pay for exercise costs and tax bills at exercise. Some companies add these transfer restrictions after issuing the shares and even push the limits of the law by claiming that they can enforce new restrictions retroactively. I hope this post has illuminated the problem of an early expiration period for startup stock options. For more on a solution to the problem, see Early Expiration of Startup Stock Options - Part 2 - The Full 10-Year Term Solution. See also Early Expiration of Startup Stock Options - Part 3 - Examples of Good Startup Equity Design by Company Stage. Thank you to JD McCullough for providing research assistance for this post. He is a health tech entrepreneur, interested in connecting and improving businesses, products, and people. Originally published February 10, 2014. Updated March 27, 2017. Restricted Stock Units ("RSUs") are not stock. They are not restricted stock. They are not stock options. RSUs are a company's promise to give you shares of the company's stock or the cash value of the company's stock. 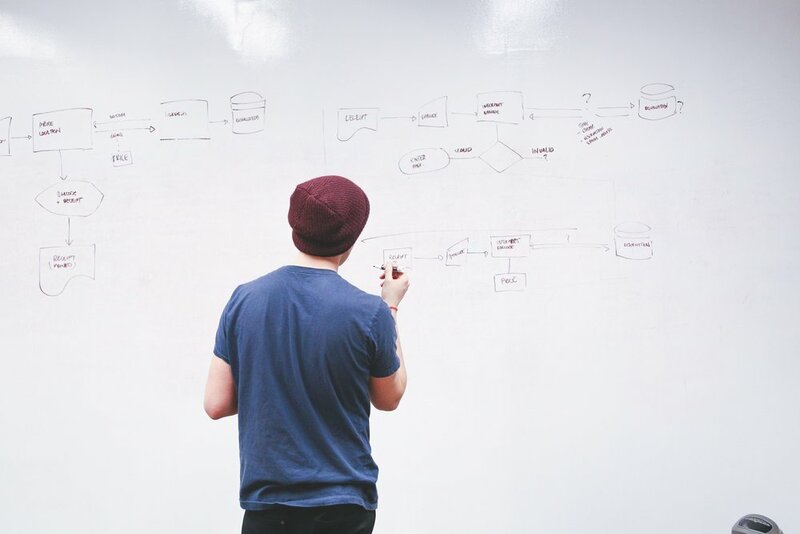 These questions may help guide your evaluation of a RSU offer at a startup. There are a lot of variables with startups and RSUs, so you are welcome to contact Stock Option Counsel for professional guidance on your situation. 1. How many RSUs are in my grant? Will I be granted more RSUs yearly or after upcoming financings? One RSU = the right to receive one share of the company's common stock at a later time, or the right to receive the cash value of one share of the company's common stock at a later time. The number of RSUs you are granted tells you how many shares of stock (or the number of shares of stock used to determine your cash payment) you will receive when they are "settled" (see #5 below). You should also find out when and if you will receive more RSU grants. If you are evaluating a job offer, there is a big difference in the value of your offer between a company that grants you RSUs only at hire and a company that plans to make additional grants each year ("Annual Grants") or after more shares are issued in financings to make up in part for dilution ("Refresh Grants"). 2. Of course there is no precise "value" for startup RSUs, but it makes sense to gather some relevant details to evaluate the offer. 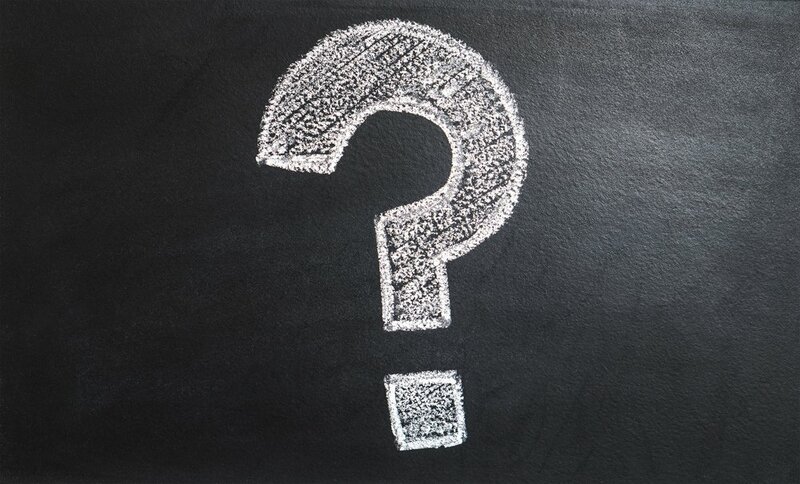 For example: What is the most recent VC price per share of preferred stock? What is the current number of fully diluted shares in the company or my percentage ownership in the company? Can you give me some guidance on the company's expected dilution, exit scenarios, exit timing and future valuation? A. Current Valuation Method (Fact-Based): For startup stock, you don't have access to a public market for the stock. Therefore, there is no precise method for finding today's value of your RSUs. Instead, use the price per share paid by venture capitalists for one share of preferred stock in the most recent financing. This is the closest number you can find for today's value. It tells you that X Venture Capitalist paid $Y for one share of the company's stock on Z date. You can find this in one of three ways: (1) Ask your attorney (Stock Option Counsel = legal services available to individual employees to guide them on their negotiation and sale of startup stock) to order the certificate of incorporation from the State of Delaware and interpret it to tell you the most recent price per share paid for the company's preferred stock. (2) Ask the company the price per share paid by VCs in the most recent round of financing. (3) Ask the company for the most recent VC post-money valuation of the company and the number of shares of fully diluted capital at that round; VC post money valuation / fully diluted capital = price per share paid by VCs in the last financing. For more on this approach, see Venture Hacks' post on startup job offers. B. Future Valuation Method (Guesstimate Based): To look forward and define a future payout for your RSUs, you have to do some guesswork. If you could guess the startup's value at exit and dilution prior to exit, you would know how much the stock will be worth when you receive it. You can make these guesses in one of three ways: (1) Ask the company to estimate different exit scenarios for you. (2) Make these guesses yourself (see John Greathouse's What the Heck Are My Startup Stock Options Worth for his guidance on how to estimate wisely). (3) Find online commentary on future value of your company, if it is close to IPO and discussed in the news. 3. What is my vesting schedule? Will any portion of my RSUs be accelerated upon change of control? You will most likely not earn the full number of RSUs simply by joining the company. They will "vest" over time, meaning that you will earn them over a set period of time (called the "Vesting Period"). If you leave the company before the end of the Vesting Period, you will not earn the full number of RSUs. The most common vesting period = "Four Year Vesting With a One Year Cliff": (1) After one full year, 1/4 of the RSUs will vest. This is called a "One Year Cliff." (2) After one full year, 1/48 of the total grant of RSUs will vest each month. Some startups require more than simply time to fully vest your RSUs. After you have "earned" them by meeting the cliff and monthly vesting during the Vesting Period, you may also have to wait until the company has an exit before they officially "vest." 4. Will I forfeit or otherwise lose my vested RSUs if I leave the company? For stock and stock issued upon exercise of stock options, some companies keep the right to repurchase your stock when you leave the company even if it is already vested ("Repurchase Rights"). Some companies have similar restrictions on RSUs, so watch out. This greatly reduces the value of your grant because it is not really "yours" even after the vesting period if, for example, you are no longer at the company when it is acquired or goes public. For RSUs it may be called "Double Trigger Vesting", which should not be confused with the employee-friendly Double Trigger Acceleration (see #3 above). 5. When will the RSUs be settled? Will the RSUs be settled in cash or stock? When will I be taxed? A company "settles" its RSUs when it gives you either cash or stock. Unlike stock options, you may not receive anything for the RSUs at the time they vest. In other words, the company may delay "settling" the RSUs. The company's Stock Plan will tell you whether you will receive the RSUs at vesting, at an IPO or sale of the company, or some other deferred time. The deferral is usually in your best interests, as it prevents you from paying tax before a liquidity event. However, it can prevent you from selling your startup stock before your company goes public or is acquired. The company's Stock Plan will also tell you whether the company plans to "settle" the RSUs with (aka "give you") company stock or the cash value of the company's stock. Knowing when and how the company settles your RSUs will help you with your tax planning. Quora: Formula for Option Grant Size at a Startup? QUORA QUESTION: Is there a generic formula I can apply to determine fair pre-IPO stock option grants based on the company's size and # of fully diluted shares? I am a tech worker who has spent all of my career with post-IPO companies and am negotiating an offer with a well-established startup of approximately 250 employees. I am not taking on a senior role. This is a simplified version of part of the process I follow with my Stock Option Counsel clients who are evaluating private company equity offers. It works best with a mid-stage startup which has had a recent funding round from a well-known VC (a.k.a. someone whose investment decision you would trust). Use Total Annual Compensation to evaluate the offer or compare to market opportunities. Certain legal terms may change the risk and, therefore, the appropriate number of shares. For more on ownership limitations, see Ownership - Can the Company Take Back My Vested Shares? For more on how companies decide the right offer for startup employees, see Bull’s Eye: Negotiating the Right Job Offer. QUORA Question: Do recent markdowns by mutual funds of private tech company valuations impact the strike price for options granted to new employees? Yes, I am seeing this in my practice. Companies that issue stock options generally set the strike price at the fair market value on the date of grant, with such value determined with an outside valuation performed every year or six months. These are known as "409A valuations." Some companies which have seen markdowns in their stock, and some other companies in the startup world, are showing their 409A valuations decreasing in their most recent outside valuations. This is relevant for new hires and existing employee optionholders. For new hires, it may make sense to agree to delay an option grant until a new valuation if the company expects the next 409A valuation to come in at a lower price than the current 409A valuation. For existing employee option holders, a lower 409A valuation may cause outstanding options to be "underwater." An underwater option is an option with a strike price that is higher than the current value of the shares. In the case of underwater options, it may make sense to ask the company to reprice the options so employees can take advantage of the lower valuations. Eliminate Negotiation in Startup Compensation??? Ellen Pao, the interim CEO of Reddit, has seen women struggle with salary negotiations. So she’s eliminating money talk from the company’s hiring process.